So last November I had my front steps redone. They were crumbling apart and very dangerous. A man named Donald Murray II who owns a business called Rockwalls & Creative Stonework in Hopkinton NY did the work for me and the results were excellent! His number is (315) 842-6556. You can see the results here! 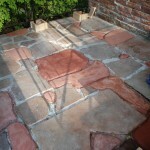 This spring I had him come back to fix up the upper patio and top steps as well as the railing bases. Once again the results were excellent! 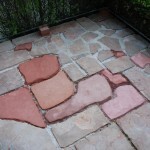 He removed all of the grime off of the stones with an acid bath, then chiseled out the stones that were beyond repair and any loose mortar. He made all new railing bases out of cement and sandstone. 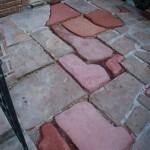 Below are some progress photos I took that show the replacement of rotten stones. I’ll post finished photos soon! Thanks Sarah! I have been to the Edwards Opera House and it is beautiful- they have a lot of great shows! Thanks for checking out my blog! Thanks Cheryl! I’m very lucky to have Anna as a friend! I’m always a fan of home improvement blogs. Can’t wait to read more about your projects! Yes! New content! You’ve unquestionably been working on your writing skills. Good show 🙂 Thank you so much for the genius of well…you!